The ProJet® 4500 gives you the power to make ready-to-use, flexible, strong parts, coloured pixel by pixel, with superior surface quality. This office-friendly 3D printer is quick and efficient, and features intuitive operation controls, so you can ensure high productivity and cut operating costs. The world of 3D printing is still young and growing tremendously in all corners of the world. 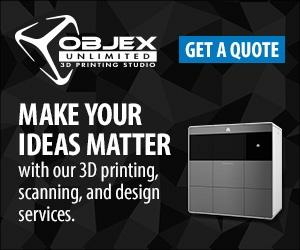 Not only are there more 3D printer manufactures and 3DP stores but also 3D printing conferences. The latest is the 3D Printer World Expo in Burbank, CA, which will be taking place on January 31 and February 1. The Toronto Public Library will offer an Intro to 3D Design course through their new Digital Innovation Hub this Saturday. The Digital Innovation Hub is home to 3D printers, 3D scanners, Arduino, and Raspberry Pi – among other technology and is set to open February 4th. Hubs like the one at the Toronto Library are incredible resources and opportunities for people who would like to learn more about 3D design, 3D technology and even give 3D printing a try. All without having to invest a lot of time and money. “The world is a complex system of biodiversity, individual components interacting, giving and taking from one another. As we begin to truly understand this concept, we can begin to harness the power of living in symbiosis with our environment.” Take seaweed, for instance. Researchers at the University of Wollongong (UOW) in Australia have been farming and processing seaweeds that will then be used biomaterials such as cell carriers in medical implants. Seaweed extracts are already commonly used in variety of goods such as toothpaste, paint, and ice cream. However, research in the field of glycobiology (the study of complex sugars called glycans in living organisms) is showing that seaweed has a major role to play in the development on new and biologically active materials for medical treatments. ROCK HILL, South Carolina –January 16, 2014 – 3D Systems (NYSE:DDD) today announced that it entered into a multi-year joint development agreement with The Hershey Company (NYSE:HSY), the largest producer of quality chocolate in North America and a global leader in chocolate, sweets and refreshment, to explore and develop innovative opportunities for using 3D printing technology in creating edible foods, including confectionery treats. The alliance combines Hershey’s world-class food science and manufacturing expertise with 3DS’ powerful 3D printing technology and knowhow to deliver new consumer experiences. 2014 has brought with it daily announcements of new, less-expensive, 3D printers. However, actually using them effectively has been an error prone process. Adobe claims it will change all of that with Photoshop CC. Photoshop CC now has support for 3D printing in corporate directly into the software. A key feature is that the printing subsystem doesn’t just send your model off to the printer, it tidies it up first, making it much more likely to print successfully. Nike Football debuted the Nike Vapor Laser Talon with a revolutionary 3D printed plate that will help football athletes perform at their best. The Nike Vapor Laser Talon was built to mater the 40-yard dash. The football cleat weighs a mere 5.6 oz. and is specifically designed to provide optimal traction on football turf and to help athletes maintain their “drive stance” longer. 3DSystems announced their new consumer products at the International CES 2014. Avi N. Reichental, the President and Chief Executive Officer and Director of 3D systems announced the release of the 3DME®. 3DSystems announced their new consumer products at the International CES 2014. Avi N. Reichental, the President and Chief Executive Officer and Director of 3D systems announced the release of the Cubify 2.0.